New babies are always so sweet. Nothing on earth is better than an infant. . . except maybe a sleeping infant. Sleeping infants are the greatest. Hands-down. I love sleeping infants. . .
. . .ESPECIALLY naked ones. Yup! What could be more charming than a happily sleeping, naked newborn? So soft! So snuggly! Unparalleled in utter adorabillity. . .
My mom rocks! She always does her very best to fulfill my random, ridiculous, and often rather particular requests, which for some reason usually involve copious amounts of yarn (and time). Like when I demanded an entire kid-sized cupboard-full of crocheted food for T’s new kitchen set by Christmas. Or the seemingly continuous appeal for knitted wool diaper covers. 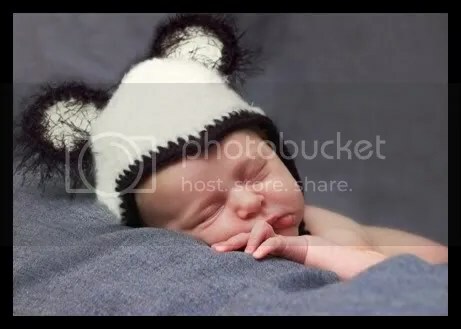 . . Or, every once in a while, for a hat made just so – with ear-flaps and fuzzy black bits, in the shape of a panda bear, and sized for a newborn’s head – To be completed before the birth of said newborn. . . somehow she always comes through! Thanks mom. . .
Way. Too. Cute! I absolutely adore the hat…and Ro, of course! Awwww… Thank you! I love you all and am happy to help. BTW, I have a new wooly soaker ready for Baby Ro. See you later! Those are adorable pics. That hat is too cute (making Ro so much the cuter). Sleeping babies are the best. Let’s actually broaden that statement, sleeping kids are the greatest. Hm…naps are pretty good for some adults (like me) too. Your Mom rocks. I see now where your creativity comes from. 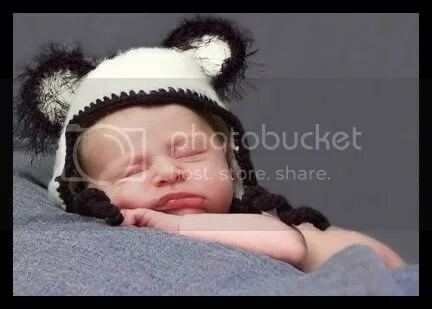 Fun to see the little one so peaceful, and so cute in that hat. These pictures will be family classics. So adorable! Can’t wait to see what cuteness you come up with for Halloween! I love the little highney sticking up in the air, lol. ahhh! 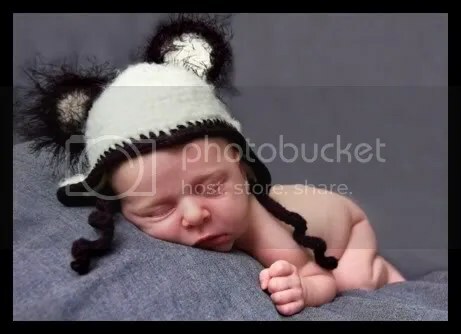 how cute is that fuzzy hat!? and why can’t the babies ever sleep for me?! they are so hard to photograph, unless they’re passed out. I can’t get over the hat… your mom is so talented. I hope you are having a love filled day. I love these photos of Ro. Very precious pics indeed. What a darling hat, the perfect adornment on such a beautiful child. Congratulations again on gaining another wonderful daughter to love! pandy is PERFECT! what a love.